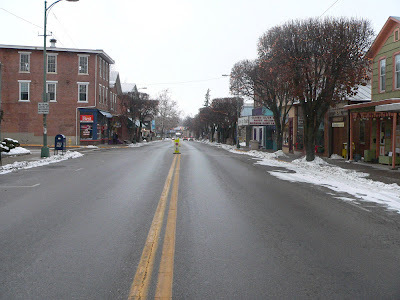 Town wasn't COMPLETELY deserted. The Peace folks were at their usual spot at noon as always. I came in to feed Mr. Eko at Dark Star and was comforted to see them there....peace on Christmas Day! Susan Gartner’s photo “A deserted Xenia Avenue on Christmas Day” reminded me of an experience some twenty years ago. A trivial incident, but it has always remained clear in my memory. It was two or three days before Christmas. Kathy and I had put our two kids to bed, and we were sitting at the kitchen table going over the list of gifts to be sure each got the same number, and nothing crucial had been missed. It seemed the only item we hadn’t found yet was a particular doll that our ten-year-old daughter felt she couldn’t live without. As we still had a couple of days to find it, Kathy decided to go to bed. There was some item we needed, a loaf of bread perhaps, and it was time for the dog’s evening walk. This was during the year or so when Weaver’s (now Tom’s) was open twenty-four hours a day. We live on West Davis Street, and I’ve always liked to walk across Mills Lawn to get downtown. On the way back the dog and I stopped in the middle of the Lawn. There was snow on the ground, but stars were out in force. Many houses were dark, but a few lights still shone in windows here and there. I stood and enjoyed several minutes absorbing the peaceful scene. As we continued home, I began thinking about the doll again. It occurred to me that big stores are open late in the days before Christmas, and that I still might be able to get the doll that night before turning in. At home I got the phone book and began making calls. Trying nearby stores first, I eventually found a Toys R Us store near the Dayton Mall that had the right doll in stock. On reaching the mall area, I was surprised at the volume of traffic and the number of open stores. Many people were shopping in the Toys R Us store, including, to my further surprise, quite a few small children. I found the doll and was soon on my way home. As I drove home, the hurly burly of the mall was gradually left behind. It was with a sense of relief that I reentered Yellow Springs where peace descended again. Let me guess... A Cabbage Patch Doll. We went through hell that year. Right you are; but it wasn't the first year, when people went crazy trying to get Cabbage Patch Dolls. As the initial popularity dwindled, they introduced variations of the Cabbage Patch Doll, things like farmer dolls and astronaut dolls. It was one of these specific types my daughter wanted, but I can't remember which or anything more about it.